HOME ABOUT HOW TO DONATE QUESTIONS? In August 2008 following an international teachers’ conference in Southeast Asia, my daughter and I were inspired by the enthusiasm that Cambodian children exhibited at the possibility of a school being built in their remote village of Mean District in Kampong Cham Province. Upon our return to the United States, I knew I had to do something to help at least one child, perhaps with a monthly donation to some organization created to help the children of Cambodia. When the new school year began, I shared some of the visual images of the trip with my Advanced Placement U.S. history class and was pleasantly surprised that their reaction was very similar to mine. They wanted to do something to help children in Cambodia, and they wanted me to find a way to make it happen. I discovered a not for profit organization named World Assistance for Cambodia that with the help of communities throughout the the world has built more than 500 schools in war torn and impoverished Cambodia. We began a fund-raising campaign that involved all five schools in the Milton, Pennsylvania district, spearheaded by the high school and supported by numerous organizations and individuals throughout the community. We were touched by everyone’s generosity. 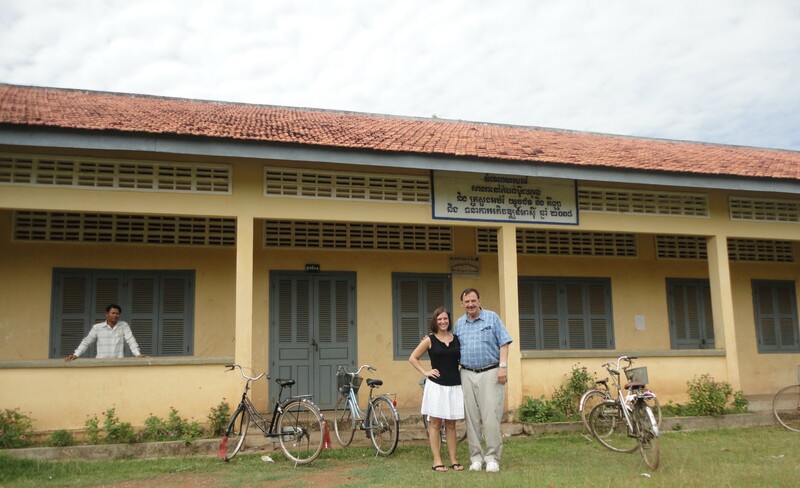 Although Milton is a rural working class community, we were able to raise the $40,000 we needed in order to authorize World Assistance for Cambodia to begin construction of school #404, the Milton School In Cambodia. The five classroom school and a well to supply the children and the village with fresh water were completed in November 2008. The following month, I escorted a group of administrators, teachers, and students to Cambodia to participate in the school dedication ceremony. The 164 students, wearing their new blue and white uniforms, formed a double line and applauded for us as we passed through them with tears in our eyes (The school enrollment has since passed 300.) I tried to inpress upon my students that this hero status afforded us by the Cambodian children would end as the educational needs of the village continue to grow. Those immediate needs now include new solar panels at a cost of $3000, a motor for their well at a cost of $400, and new computers (their link to the outside world as they do have internet access) at a cost of $400 per computer. It is hard to imagine the sheer terror inflicited upon these people by Pol Pot and his Khmer Rouge regime. They starved and murdered more than two million of their own people, nearly one-third of their population. They burned all schools and destroyed all textbooks as they killed all the teachers and promising young students. The only future for the children of Cambodia is the hope that education will provide these deserving children with the tools they will need to provide for a better life for their families. Please help the children of Cambodia, children only one generation removed from the Killing Fields.